The human immune system is made up of one trillion lymphocytes. Although dispersed throughout the organism, these cells behave as if they belonged to a single organ. To attain this homeostasis, the lymphoid cells home to and are controlled in lymphoid tissues where, in specific microenvironments, they communicate with each other or with accessory cells and proliferate, mature, or die under stringently controlled conditions. The germinal center microenvironments are among those controlling the B cells which, during the T-dependent humoral immune responses, undergo important phases of their life cycles: activation, proliferation, the isotype switch, affinity maturation, deactivation, apoptosis, etc. 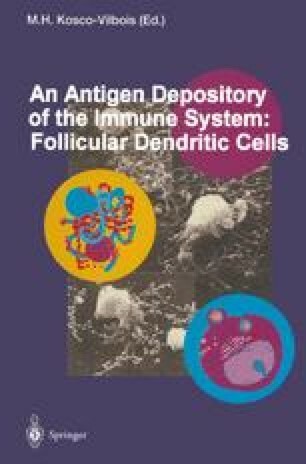 The follicular dendritic cells (FDC) are major components of the germinal center microenvironments. Here, we examine their origin and their influence on B cells in the light of recent experimental data.